Roger Deitz has been on the road with Willie Nelson – sharing a bottle of Jack Daniel’s on the tour bus while an IRS agent went over the evening’s concert receipts. Deitz hung out back stage with his acting coach Michael Moriarty, discussing the theater with Kevin Kline and Amy Irving. He has compared musical licks with Don McLean and John Hartford, participating in a mind-blowing ’till dawn jam at the NCC Long Island Folk Festival with David Bromberg, Roger McGuinn, and Phil and John Cunningham of Silly Wizard. Deitz sipped champagne at The Russian Tearoom with Bill Murray and Emmylou Harris, dated Peggy Noonan at Fairleigh Dickinson University and shared a corned beef sandwich with historians Will and Ariel Durant at Canter’s Deli in Los Angeles. Deitz also served Bill Monroe a dry martini at the ASCAP awards dinner in Nashville when the father of bluegrass mistook Roger for a waiter, albeit one clad in a seedy tuxedo. In addition, thanks to the efforts of his dear departed agent and manager Len Rosenfeld, Roger Deitz has appeared on stage with just about every folk related name one can name. The list includes Richie Havens, Tom Paxton, Odetta, Pete Seeger, Arlo Guthrie, Utah Phillips, Melanie, Don McLean, Shawn Colvin, Suzanne Vega, Oscar Brand, Gamble Rogers and the list goes on and on. His recent album and CD Love Songs, Now and Then is a tribute to the many faces of love – containing fourteen of his artfully written and performed songs. Yes Virginia – there is a folk music Zelig, and he skillfully plays the guitar and banjo. But unlike the movie Zelig, Roger has made his mark contributing singularly heartfelt music and superbly written articles and columns. “I’ve called myself a folk Zelig but that’s misleading. The Zelig of the movie was someone who was just there. I wasn’t only standing next to a famous musician or individual — this was always a person I wanted to meet. And by talking with these people, or trading stories and songs, when I walked away, each time, I was better for it.” Roger is as much at home sitting in front of his word processor as he is standing in front of an audience. Perhaps that’s one reason Deitz is the recipient of the New Jersey Folk Festival’s 2012 Lifetime Achievement Award. 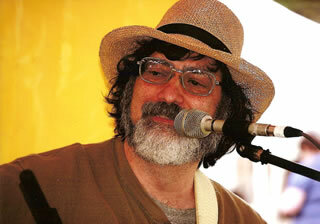 Roger Deitz authored The Folk Music Chronicles, a collection of his Fast Folk columns in book form. His recent book 15 Years of RagTag is a collection of 56 of his insightful and humorous Sing Out! columns, which have graced the last page of the magazine since 1995. Deitz is a founding member of the North American Folk Music and Dance Alliance (Folk Alliance International) who is the primary author of “New Jersey and Popular Music” in the Continuum Encyclopedia of Popular Music of the World. For many years Roger Deitz has emceed and performed his music for crowds as large as ten thousand at the Philadelphia Folk Festival, and other notable venues. Deitz played a role in the seminal days of up-and-comers, as a member of the Fast Folk collective of artists in Greenwich Village in the eighties. This as a performer and chronicler of that vibrant folk scene centered at the Speakeasy for the Fast Folk Musical Magazine, which carried his writings and songs. Deitz helped advance New Jersey’s folk scene in the 1980s as program director of The June Days Folk Festival and the Closing Circle Coffeehouse for the Folk Music Society of Northern New Jersey. Not only was he a mentor to folk performers through his teach-ins and articles, many of these artists played first in New Jersey through his aegis. Cheryl Wheeler, Patty Larkin, Christine Lavin, John Gorka, Nanci Griffith, and an army of others were introduced to area audiences via his intuitive and savvy bookings. More recently he served as special concert chairman for The Folk Project. As a regular guest on Happy and Artie Traum’s public radio show, “Bring it on Home” out of Albany, WAMC, Deitz treated listeners to his unique stories and songs; some humorous, others very touching. His playing has been termed, “classy, not flashy” and some of his songs (such as “The Sheep Dip,” and “FiFi the Microwave Pup”) have helped create a cult following. Deitz’ debut album made the East Coast Rocker’s top ten best list for 1988. A native of Clifton, New Jersey, Deitz earned his High School letter in golf as a member of the school’s winning golf team. He went on to attend medical school (briefly), and graduate schools in New Jersey, teaching courses such as Biology and Microscopic Anatomy at Rutgers University, St. Peter’s College and Bloomfield College. In 1981 he founded Rescan Associates Inc, a consulting firm that worked at research and development companies and has plied his trade at Hoffmann-La Roche, Allied-Signal, and ATT Laboratories. “Sounds *great* Congrats! !” Mark Moss, Editor of Sing Out!